i lost everything when my hard drive crashed. slowly but surely trying to get everything I lost. I don't think I am going to be able to affrod the data recovery, at least in the immediate future. I am getting quotes from 900-1900. lesson learned to back everything up. Funny, I also received another email today from a webinar viewer asking about how I backup my photos. I don't often think of backing up my data because my backup software does it for me - automatically - and at the end of every day. I have the software set to backup any new or modified files at 11pm each night. Only once have I had to request a full restore of my hard drive, but occasionally I use its restore features to retrieve a file I have accidentally deleted or overwritten. For the past couple of years I have used the Backblaze service (I happily used Mozy.com for a long time before they raised their rates). Backblaze is still just $5/month for unlimited storage space. As their website mentions, it's not a question of will you lose your data--it's when. Don't take a chance. Since most of us here at Millennia use Backblaze, we've now partnered with them. Here's the link for more information. Backblaze is just one of many off-site backup services. Which do you use and why? FamilySearch has added more than 7.3 million images this week from Austria, Brazil, China, Honduras, Luxembourg, Peru, Portugal, Switzerland, and the United States. Notable collection updates include the 5,766,135 images from the new U.S., Massachusetts, Land Records, 1620–1986, collection, the 337,367 images from the new Honduras, Civil Registration, 1841–1968, collection, and the 191,701 images from the new U.S., Hawaii, Honolulu Passenger Lists, 1900–1953, collection. See the table below for the full list of updates. Search these diverse collections and more than 3.5 billion other records for free at FamilySearch.org. 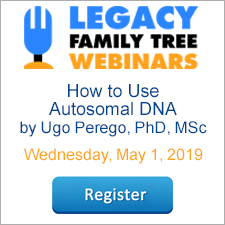 The recording of today's webinar, "The New Frontier in Genetic Genealogy: Autosomal DNA Testing" by Ugo Perego is now available to view in the webinar archives for a limited time. Ugo first presented an overview of where autosomal DNA fits into our genealogy research efforts and then compared and contrasted the services of the four major autosomal testing companies. If you are considering adding DNA research to your genealogy toolbox, this webinar is well worth your time to view. If you could not make it to the live event or just want to watch it again, the 1 hour 34 minute recording of The New Frontier in Genetic Genealogy: Autosomal DNA Testing is now available to view in our webinar archives for free for the next 7 days. It is also available to our monthly or annual Webinar Members for the duration of your membership. Visit www.FamilyTreeWebinars.com to watch. Members also have access to the 4 pages of syllabus materials. The special discount coupon of dna3 that was announced during the webinar is valid for 10% off anything at both www.LegacyFamilyTreeStore.com and www.FamilyTreeWebinars.com through Monday, June 3, 2013. What does a piano and a cello have to do with genealogy? A lot more than I thought. "I've recently begun my genealogical research. After looking into the genealogy of my cello and the genealogy of John's piano, I've found that they share a common ancestor - the TREE!" I thought it was cute...and it gives me a little bit of pride whenever I hear someone talk genealogy. It's music to my ears. In recent years, four major laboratories have begun to offer autosomal DNA testing with the purpose of reconstructing information about our ethnicity, our genetic cousins, the geography and migrations of our ancestors, traits and medical predispositions we might have inherited from them, and even how much Neanderthal DNA we might have in our genes. After the male-inherited Y chromosome (Ycs) and the maternal mitochondrial DNA (mtDNA), autosomal DNA testing offers many insights into a person's past and how he/she might be related to other people. While Ycs and mtDNA are limited to the two outermost lineages in the pedigree chart, autosomal DNA offers a genetic painting of all our ancestors. It is an exciting time for genealogists as the new cutting-edge technology in DNA testing for family history is both affordable and accurate, revealing information about our past that just few years ago was deemed impossible. In this lecture, Ugo Perego will explain the major autosomal DNA tests available to genealogists, how they work and what to expect from them in order to reconstruct our genetic family history. Join us for the live webinar with Ugo Perego on Wednesday, May 29, 2013 at 2pm Eastern U.S. Register today to reserve your virtual seat. Registration is free but space is limited to the first 1,000 people to join that day. Before joining, please visit www.java.com to ensure you have the latest version of Java which our webinar software requires. When you join, if you receive a message that the webinar is full, you know we've reached the 1,000 limit, so we invite you to view the recording which should be published to the webinar archives within an hour or two of the event's conclusion. Ugo A. Perego, PhD, MSc, is the CEO for the Salt Lake City based Genetic Genealogy Consultant and a scientist affiliated with the DNA laboratory of Professor Antonio Torroni at the University of Pavia in Italy. He has previously worked for more than a decade as a senior researcher with the Sorenson Molecular Genealogy Foundation and GeneTree.com both based in Utah. Ugo earned a BSc and an MSc in Health Sciences at Brigham Young University (Provo, Utah) and a PhD in Genetic and Biomolecular Sciences at the University of Pavia, Italy. Ugo has contributed numerous lectures and publications on DNA and its applications to population genetics, genealogy, ancestry, forensics, and history. Some of his recent publications include “Decrypting the mitochondrial gene pool of modern Panamanians” (in PLoS One, 2012); “The Mountain Meadows Massacre and ‘poisoned springs’: Scientific testing of the more recent, anthrax theory” (in International Journal of Legal Medicine, 2012) “Mitochondrial haplogroup C4c: a rare lineage entering America through the ice-free corridor?” American Journal of Physical Anthropology, 2011); “Expanding the concept of family history through DNA” (in Family Chronicle, 2010); “Mitochondrial DNA: a female perspective in recent human origin and evolution” (in Origins as a Paradigm in the Sciences and in the Humanities, 2010); and “The initial peopling of the Americas: a growing number of founding mitochondrial genomes from Beringia” (in Genome Research, 2010). If you use Google - for any reason - but especially for searching for your ancestors, today's webinar by Lisa Louise Cooke is a must-watch. In fact, I personally feel this may be one of the more important classes you ever attend on genealogy technology. If you could not make it to the live event or just want to watch it again, the 1 hour 30 minute recording of Google Search Strategies for Common Surnames is now available to view in our webinar archives for free for the next 7 days. It is also available to our monthly or annual Webinar Members for the duration of your membership. Visit www.FamilyTreeWebinars.com to watch. Members also have access to the 2 pages of syllabus materials. The special discount coupon of cooke that was announced during the webinar is valid for 10% off anything at both www.LegacyFamilyTreeStore.com and www.FamilyTreeWebinars.com through Monday, May 27, 2013. The recording of today's webinar, Ten Hidden Resources Every Genealogist Should Know, by Lisa Alzo, is now online to view for free for a limited time. I think she gave us way more than just ten fantastic resources, and her syllabus materials were excellent too. If you could not make it to the live event or just want to watch it again, the 1 hour 19 minute recording of Ten Hidden Resources Every Genealogist Should Know is now available to view in our webinar archives for free for the next 7 days. It is also available to our monthly or annual Webinar Members for the duration of your membership. Visit www.FamilyTreeWebinars.com to watch. Members also have access to the 7 ages of syllabus materials. The special discount coupon of hidden that was announced during the webinar is valid for 10% off anything at both www.LegacyFamilyTreeStore.com and www.FamilyTreeWebinars.com through Monday, May 27, 2013. Today's webinar by Mary Hill was one for the ages. Every genealogist - from beginning to experienced - needs to watch the recording of Land Records Solve Research Problems. And if you are not yet using land records as part of your genealogy toolbox, what you learn from Mary will open genealogical doors you never knew existed. If you could not make it to the live event or just want to watch it again, the 1 hour 26 minute recording of Land Records Solve Research Problems is now available to view in our webinar archives for free for the next 7 days. It is also available to our monthly or annual Webinar Members for the duration of your membership. Visit www.FamilyTreeWebinars.com to watch. Members also have access to the 4 pages of syllabus materials. The special discount coupon of land that was announced during the webinar is valid for 10% off anything at both www.LegacyFamilyTreeStore.com and www.FamilyTreeWebinars.com through Monday, May 20, 2013. Have You Really Looked Everywhere? Thanks to guest blogger and webinar speaker, Lisa Alzo, for the following article. As a genealogist are you a creature of habit? When looking for ancestors do you tend to search only online? Do you visit the same databases over and over again, hoping to get that “magic” result? You know - the one with the special power to help you break down your research brick wall? Do you shy away from investigating an offline resource that’s tucked away in a courthouse basement, a library across the country, or foreign archive because it’s too time consuming, too expensive, or takes too long to obtain? Sometimes we need to break out of the mindset of wanting our desired genealogical information to come easy. Let's face it, we’re all a bit spoiled by all of the great record images and indexes and other data available to us online, whether through free or subscription-based websites. But there is so much information we miss because it's not convenient or desirable to step away from our computers, tablets, and mobile devices. Genealogists learn about conducting a “Reasonably Exhaustive Search” (one of the elements of the Genealogical Proof Standard), but sometimes we need a reminder. Think about the research you have done, and then consider those “hidden” or underused resources that you either haven't thought to look for, didn't know about, or dismiss because you prematurely assume your ancestors won't be found in them. Here are three places where you may discover hidden information. 1. Personal and Family Documents. I know you’re probably thinking, “What more can I possibly find in home sources?” Or, perhaps, “But, I don’t have personal items that belonged to my ancestors.” You should review all the research materials you gathered, whether you inherited from your parents, grandparents, or other relatives, or whether you have had to get the information from public records. Have you missed any clues? Have you considered the name of a witness on a marriage license or naturalization petition, or the names of the godparents on a baptismal record, and how these individuals were connected to the ancestor you’re researching? Check through the ephemera too, and ask all of your relatives to check through their attics, basements, closets, and storage units. For example, I have an international money order receipt found by my cousin that documents my paternal grandfather sent money back to his parents in Slovakia so his family could purchase land (some of the land is still owned by relatives today). This piece of paper includes my great-grandmother’s maiden name! In addition to this gem, I have church lodge paperwork listing my grandparents as officers, many historic postcards from the towns where my ancestors lived, my mother’s bridal book, and my father’s navy diary, among other keepsakes—all contain clues I have used in my research. 2. A Different Database. Do you routinely search just Ancestry.com, or FamilySearch? Consider typing your ancestor’s name into a search field of a database you might not normally check, such as the United States National Archives and Records Administration’s Access to Archival Database sets (free to search), or doing a search on Mocavo. For example, I’ve known about subscription site FindMyPast for years, but because I don't have English, Irish, or Welsh ancestors (my ancestral villages are in Slovakia) I never bothered to search the site. Recently, I decided to run a search for some surnames in FindMyPast. Imagine my surprise when I found the surname in Passenger Lists Leaving UK 1890-1960, some Birth, Marriage, Death (BMD) indexes, and even a small story in one of the British newspapers about a coroner’s request into a death of an infant who had this surname. This search has provided many leads for me to follow for more information. 3. Town or County History Books. Have you checked ALL of the town and county resources in the area(s) where your ancestors lived? Many genealogists use Google Books to find these books, such as the one shown at right (History of Pittsburgh and environs). But, countless more can be found in public, college, and university libraries around the world. Don't brush these resources aside just because you can't search them online, or because it’s not convenient or easy. Can't get there? Start by contacting the library—most will have a website, or pick up the telephone or e-mail them. If the staff will not do lookups (some will for a fee), ask for a contact at the local genealogical and historical society, and then ask that person for recommendations for a local researcher you could hire, or use a professional researcher. For recommendations, check Cyndi’s List—Professionals, Volunteers & Other Research Services, or the Association for Professional Genealogists. Reach out to your social networks, perhaps you can find someone who is willing to help (just remember to pay it forward and offer to help someone else who may need information that you can get or provide). 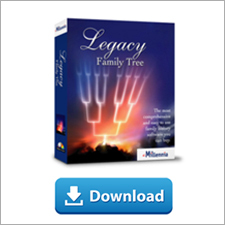 Don't forget the Local Histories section of Legacy Family Tree's Research Guidance. It contains the most comprehensive listing of available local and county histories for the United States. In Research Guidance, click on the Preliminary Survey tab, then click on the Local Histories tab. Legacy will display all known books for just the locations where your ancestor lived. Also check out our brand new Legacy QuickGuide: Researching County Histories. You can learn more about these and other underused resources in my upcoming Legacy webinar on “Ten Hidden Resources Every Genealogist Should Know” on Wednesday, May 22, 1013. Click here to reserve your space now!